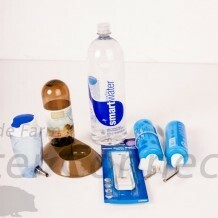 Water bottles are one of the most popular methods of offering fresh, clean water to small mammals including hedgehogs. 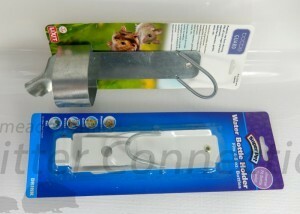 Online pet accessory stores carry inexpensive bottle-brushes that will help keep the bottle clean. Baby bottle-brushes will also fit in many traditional water bottles. Fresh water receptacles and water should be given every 24 hours. Some hedgehogs are so messy with their feet in their water, their water bowl is changed 2x a day. Special brushes designed for water bottles clean more thoroughly that simple rinsing. Water bottles are typically less messy compared to dishes especially if bedding is being used other than cage liners. It is easier to monitor how much water your hedgehog is actually drinking with a water bottle as opposed to water being spilt out of a water bowl. You may consider switching to a water bowl if you notice your hedgehog chewing or jerking on the metal tip of the water bottle. A hedgehog can damage its teeth on the tip of the bottle. It is a good idea to replace plastic bottles after one year. Toxins can leach out of the bottles as they age. Replacing water bottles on a regular basis is a simple and relatively inexpensive safety precaution. There are reports of hedgehogs getting their tongues stuck in the tips of water bottles with damage to the point of tongue amputations. However, in 13 years of breeding hedgehogs we have never had experience with such misfortune. According to information provided by Ginger Manufacturing: For best results, fill your water bottle with water that is slightly warmer than room temperature. Invert the bottle and touch the ball tip a few times to release enough water to establish a vacuum. If you fill your water bottle with cold water, it will continue to drip until the water reaches room temperature and establishes a vacuum. Occasional drips will occur while the water inside adjusts to higher room temperature changes. (Ginger). Do NOT place your animal or water bottle in direct sunlight. Your water bottle is likely to drain if the tip is allowed to maintain contact with the bedding material, the side of the cage, or anything else within the cage. The hanger is sturdy, hence the water bottle is not easily pushed out of the hanger and the hanger is not easily knocked off the cage if attached properly. Our experience with the “U” shaped wire clips (that are often included in the package with the bottle) is that they are not well suited for hedgehogs or their cages. Hedgehogs may be able to get more water faster by lapping from a bowl than from a water bottle. Hedgehogs lap water from the edge of a pool of water in the wild. A hedgehog needs to put its long snout down into a bowl to drink. This can present a problem for your hedgehog because it can aspirate on the water (inhale water through its nose into its lungs). (Martin). 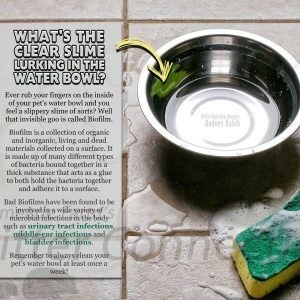 One suggestion to prevent bedding from getting into the bowl is to put the bowl atop a large garden sidewalk paver or other flat stone (properly disinfected of course). 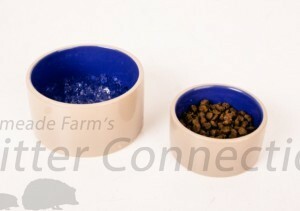 The stone will also naturally help to wear down the hedgehog’s nails and give additional exercise and stimulation. We sometimes use the 2 1/2” to 3” size crocks for babies and for treats. The larger 4” crocks seem to work better for adult hedgehogs. The 4” crocks help prevent bedding from contaminating the food. In the past, many crocks had a blue glaze inside that contained a lead base glaze. 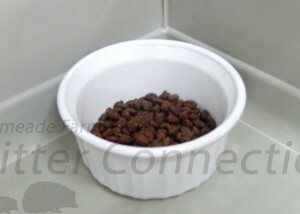 The current production standards for many companies no longer allow lead in glazes used for pet products. However, if you are in doubt about the safety of your crocks, many other options are available. Always replace the crocks if the interior glaze is chipped or any part of the crock itself is chipped to avoid cuts and collection of germs inside the crack. The Bartel family are customers who gave us a great tip for keeping hedgehogs from tipping their crocks. They glue the crock to a piece of ceramic flooring tile. The tiles are inexpensive, easy to clean, and can be discarded with the crock if one should break. Choose a tile that has smooth edges rather than one that has sharp sides that could injure your pet. 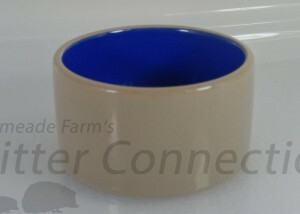 The restaurant style hard plastic ramekins (small dishes used for baking and serving an individual portion of food). Ramekins are easy to clean and typically will not break. Dessert bowls or small cooking dishes are similar in size to 4” crocks, but they may not be as heavy as crocks and can be easily tipped. This style of dish is sold for reptiles but it has low sides, which is especially nice for young hedgehogs. The corner dish fits nice and tight into an aquarium, which saves limited floor space. This type of dish will require giving your hedgehog a boost up to the appropriate should height needed for drinking. The garden stone mentioned above will work quite nicely. 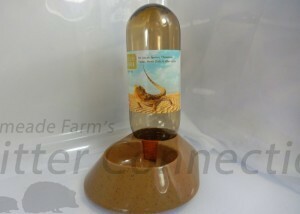 If you decide to switch your hedgehog’s water receptacle, try offering both types (bottle and bowl) for several days. You should never just switch them to a new and foreign way of drinking without being 100% sure that they have learned to drink from the new source. Hang the bottle over the water dish to entice drinking of both receptacles. 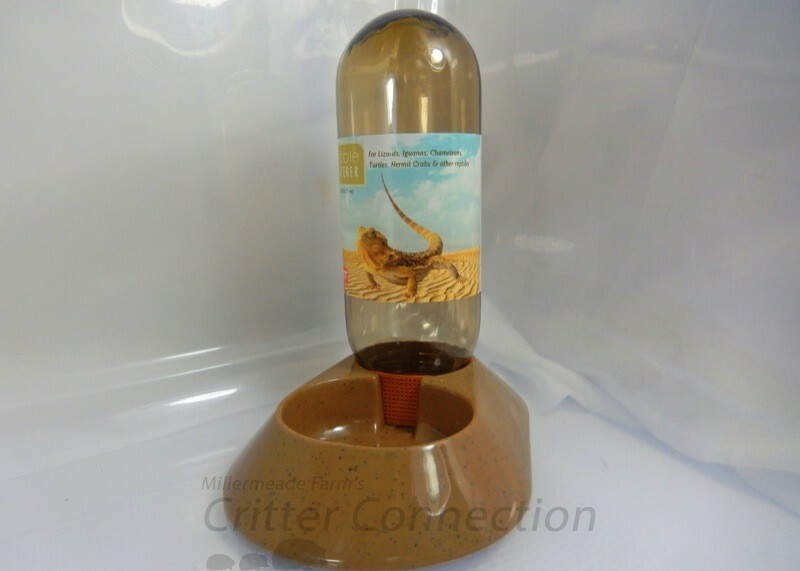 Be patient and give plenty of time for your hedgehog to get the hang of the bottle or bowl. Keep in mind that once a hedgehog is used to one or the other, it may be difficult for it to make the switch. Regardless of the type of dish you use, you will want to wash and disinfect it on a regular basis.